Decadent breakfast with easy Peanut Butter Banana Stuffed French Toast sandwich. 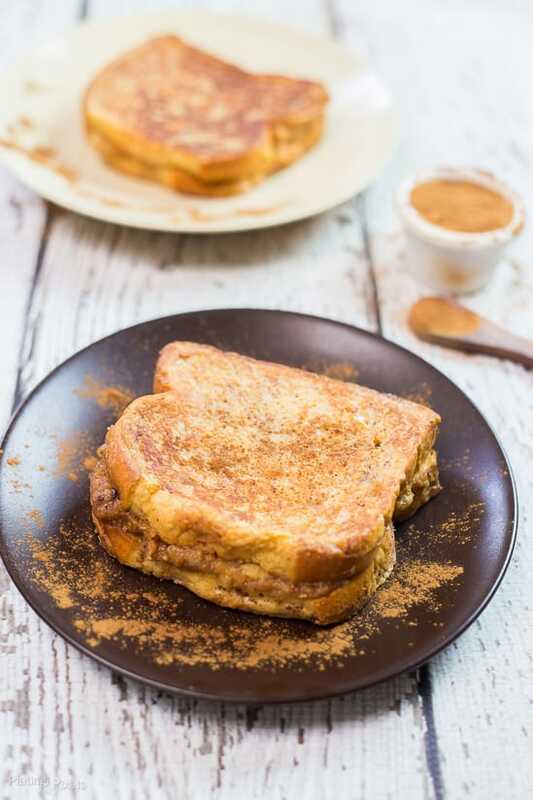 Creamy peanut butter, ripe banana, cinnamon and maple syrup sandwiched between sweet french toast. 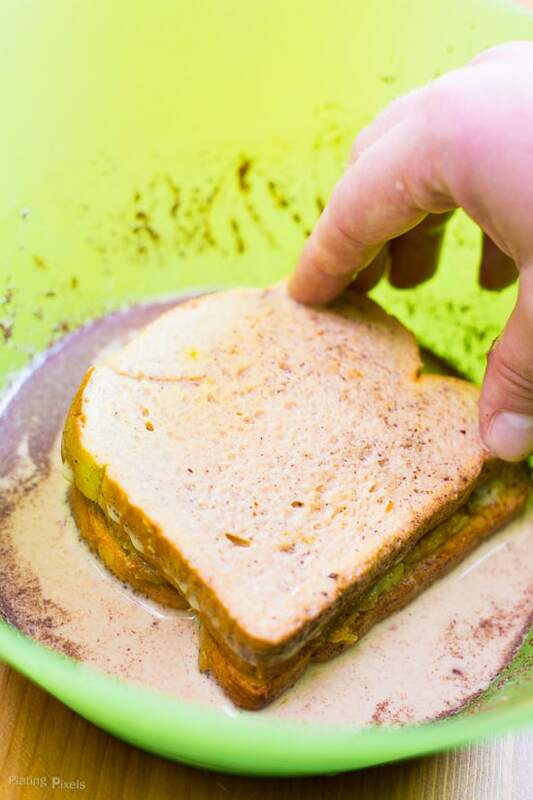 Within this post you’ll learn how to make a unique stuffed French toast sandwich. Plus you’ll learn a trick to keep the bread firm when soaking in the liquid. No more soggy French toast. Some weekends (or if you’re feeling fancy, weekdays) call for something different. Between getting ready, emails, morning workouts and making coffee; breakfast can easily become an afterthought. A smoothie, cereal or simple eggs are fine, but I got you covered if you want something special. Stuffed french toast is well worth planning as part of your morning, especially if it’s Peanut Butter Banana Stuffed French Toast. That’s right. Peanut butter. Banana. And Stuffed. I made mine out of sliced brioche because I was feeling extra fancy. It’s the fall season and hearty recipes come naturally, but looking back at my recent post I realize I’m moving towards sharing comfort foods. Can you say Candied Bacon Au Gratin Potatoes? There’s plenty of healthy eating going on around here too, but I enjoy sharing the more unique and decadent ones. Stuffed French Toast is why you’re reading this. It’s quite simple, and takes less than 30 minutes. 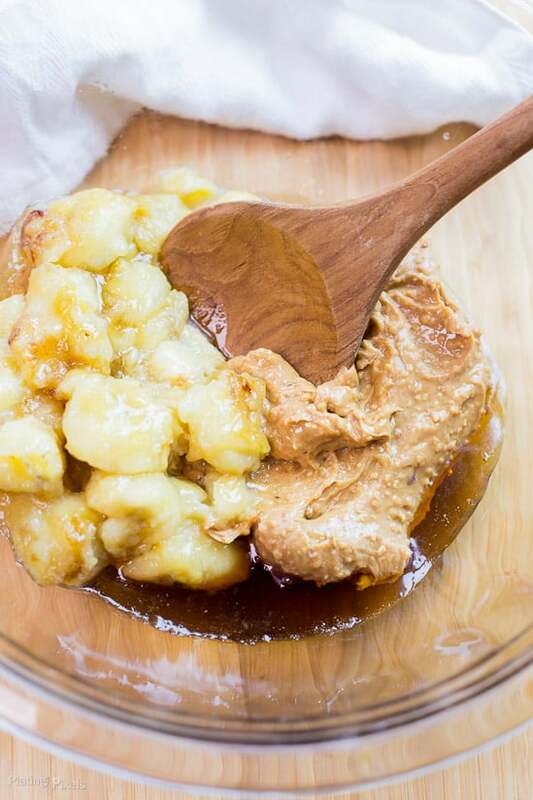 Peanut butter and bananas are critical ingredients. Is there a better combo out there? If you find one please let me know. Making these are quick and super simple. Just sauté bananas in a bit of butter and maple syrup, then mix with peanut butter. Top onto lightly toasted bread slices (cute teal baking pan optional). Dip in liquid and cook to a golden brown. 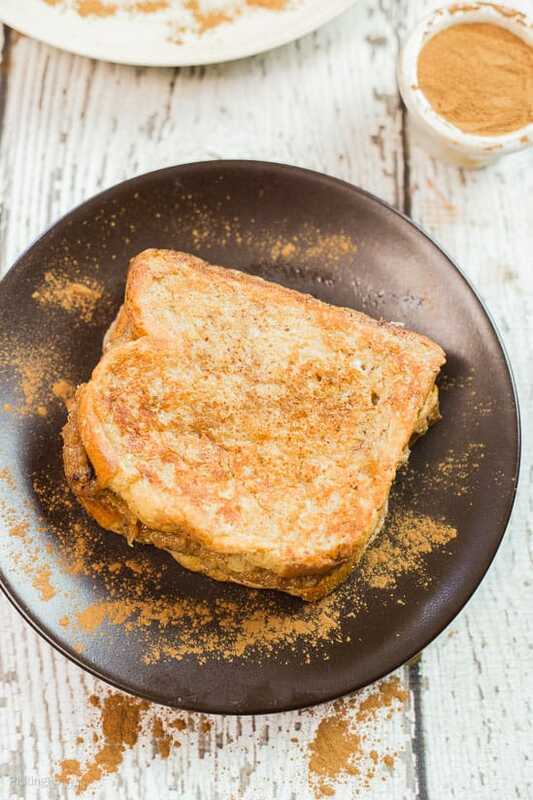 This banana stuffed french toast is perfect with peanut butter. Silky, smooth, creamy, and a bit of crunch. Textures collide into a euphoric breakfast recipe worthy of treating yourself to any time. This recipe is adapted from my Banana Cream Cheese Stuffed French Toast Sandwich with Strawberry Topping if your looking for more breakfast treats. No more soggy French toast with this recipe. There’s a couple tricks to help with this. One, you can use stale bread. But I find it’s not as fresh (obviously) and the flavor isn’t so good. Plus you run the risk of your bread spoiling (unless it’s full of preservatives) or drying out too much. The easy trick? Use quality fresh bread, but toast in the the oven before dipping in the liquid. About 5-6 minutes of toasting is all you need. You can even use a traditional bread toaster but watch carefully. The bread crisps, without browning, as is perfect for soaking up French toast liquid while holding it’s shape. Flavor profiles: Perfectly sweet; banana and maple syrup combined with peanut butter. Texture: Creamy, fluffy filling between chewy bread, with just a bit of crunch from the peanut butter. Dietary Options/Substitutions: Use gluten-free bread if needed. 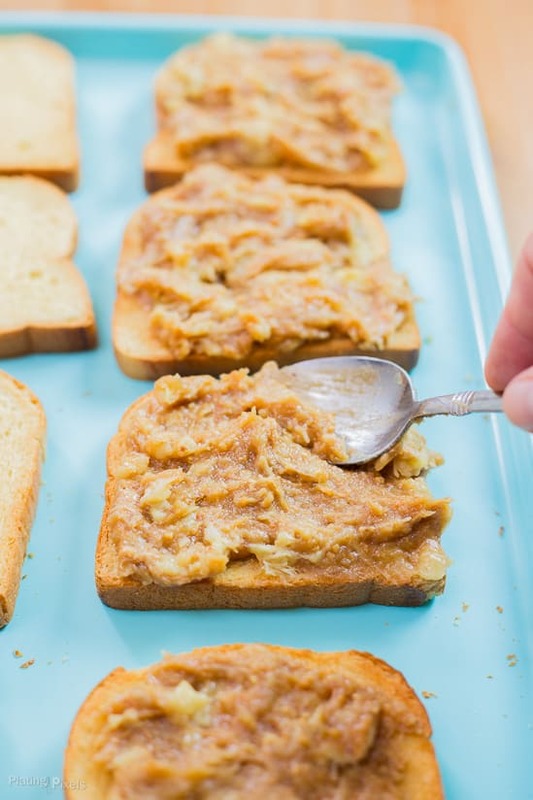 Creamy, fluffy banana peanut butter filling between chewy toasted French bread. Preheat oven to 400º F. Place bread slices on a baking sheet and bake 5–6 minutes to slightly dry out and crisp bread. Remove bread and turn off oven. In large pan melt half of butter on medium heat. Add bananas and 2-tablespoons maple syrup, sauté 3–4 minutes until softened. Remove from heat and stir in peanut butter and 1-teaspoon vanilla. Evenly spread mixture on 4 slices of bread, and top with remaining bread slices to create sandwiches. In a flat bowl whisk together milk, eggs, cinnamon, 1-tablespoon maple syrup and 1-teaspoon vanilla. Dip both sides of sandwiches in liquid (allow each side to sit about 15 seconds to soak up). Melt remaining butter in large skillet or pan over medium heat. Toast sandwiches, 3–4 minutes per side, until cooked and golden brown. Serve immediately, extras can be stored sealed in fridge and served leftover. Glad I can provide some new info for you. Thanks Ashley! Oh my goodness this looks so good, can’t wait to try! Thanks Claire! I hope you do! yum! this just seems like such a delicious and filling sunday type of breakfast! This is my kind of breakfast. Looks fantastic and great tip about what bread to use! Thanks. I figured I’d try that trick after too many soggy toasts. Works like a charm. Thanks Tammy! This recipe looks delicious! Thank you for sharing such a great French Toast dish… I can’t wait to try it! I’m glad too. Thanks Ashleigh! OMG!! You’re killing me right now with this French toast!! Banana, peanut butter, bread….Just perfect together!!! Haha thanks Ludmilla! That’s a perfect response and made my day.